More than just putting a rotary-winged aircraft on the White House lawn; more than the enormous prestige of flying the President, when its time arrives, this will be a substantial procurement by a truly excellent client which needs a significant number of airframes as well as life-time support for the largest flying unit of the U.S. Marine Corp. Needless to say, even without a selection/decision date competition is already fierce and controversial in many circles. The included options for this replacement programme do not overlook refitting existing aircraft types; nor the VH-60Ns, a heavily modified variant of the U.S. Army's Black Hawk built by Sikorsky; nor the MV-22 tilt rotor which is an outgrowth of Bell Helicopters revolutionary V-22 Osprey project, and two relatively new aircraft offered by consortiums competing to replace Marine One. If a new-build replacement option is taken, the contract winner will have an opportunity through vigilant support to prove their machine is the most honoured and reliable on the planet. Small in number compared to many U.S. mil-spec aircraft procurements, it is a substantial helicopter order and moreover this one is important to the prestige of the U.S. industry as well as to the American armed services. Out of the ordinary though is the buzz in Washington that predicts the winner will be a European-designed machine. The reasoning that is based on is mistaken. The political climate as well as the proven performance of the European contender EH101 bode well for the large, robust, three-engined helicopter. Fitting it on the White House lawn might require expanding the property line, however. That's not to say it isn't a suitable contender. It is. Great Britain's Westland Helicopters is a primary partner in the EH Industries consortium and the United States has had no better friend and ally than Great Britain for many a decade. Britain and the U.S. have created aviation industrial partnering arrangements which are the envy of the world so there is no question about the ability of the two nations' industries to work together. The same applies to Italian maker Augusta. We could talk about Persian Gulf political markers but lets not go there. Those are better paid out in different and more substantial ways in the diplomatic and policy worlds. Bell helicopter is on the 101 team and would play a building role for the US101 if selected. But in both the industrial and the political context, the Bell Helicopter regional benefits would seem to amass to a higher level if the V-22 were to replace the current H-3. The purely domestic U.S. offering comes from Sikorsky which has entered the competition with a fresh new aircraft design that in its current form has few but growing in-service flying hours. Clearly it is an impeccably purpose-designed contender given the timing. Nevertheless, either helicopter, the European EH101 or the American S-92 meet the specs. and could do the mission admirably. In the context of the big picture, even considering the politics, the U.S. has only one good choice though: the domestic option. Name two main challenges the American people face. Energy self sufficiency and jobs, right? Well, my Yankee friends, listen to your indigenous air transportation industries. While you listen, look at their vision and how they are approaching their new horizons. The U.S. air carriers must soon go through a transition to more secure, higher frequency, smaller load, city-to-city service. If commuting a hundred miles to work isn't soon like a breeze, there will be a problem. Outside the hubs, the country and its economy must get back on the move and begin to shuttle more people, goods and services across domestic short hops. More and more workers will leave their at-home networked work stations and commute brief hops rather than move their homes. The younger, adaptive U.S. work force will become more versatile and mobile to compensate for shifting employment dirths and the sputtering gasps of failed "globalization". The radius of job seeking and employee search will necessarily expand beyond the current 25 mile radius. Affordable aircraft in some new shape within a whole new safety standards regime will precede a rapid evolution. In this age where the accelerating rate of change has elected heads spinning in most capital cities around the globe, the free market must be nourished and encouraged to move naturally within its own domain, unfettered by political impositions. Washington needs to back the gutsy Sikorsky which foresees a domestic transportation metamorphosis in which it wants a substantive role. Downstream, the best and the brightest will, as always, draw their own kind to themselves and this thing called American ingenuity and leadership will once again blossom. To say that opting out of the European helicopter programme is to forever abandon membership in a potentially lucrative European industrial integration is like suggesting water shall mix with oil. It sounds lovely but it won't work for long. Globalization is a dead thing in the face of flag waving nationalists the world over. That's the trend. Not globalization. Let's all still talk to each other, but as it truly shall be no matter what else, we'll all sleep in our own beds when the day is done. The multi-role Sikorsky S-92A and a variation of the European Helicopter Industries EH101 are currently the foreseen new-build replacement contenders. Both are exceptional machines with exemplary capabilities and as a testament to the General Electric CT7/T700, both aircraft use the same engine, three (CT7-8) powering the US101 and two units for the lighter S-92. Having flown variants of both aircraft, this pilot/writer would want to fly 'brass', like a national president, in the Sikorsky S-92 which has a scramble start time under 100 seconds. On the other hand, if the V-22 could be given the nod, a serious and intriguing option that would put a four-decade-long-dream machine on the White House lawn. 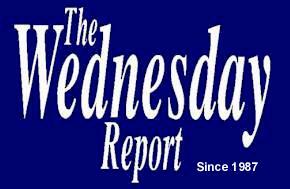 It's almost an earth-shattering notion for many of the old timer rotor heads, not to mention the bevy of politicians who have fought valiantly over the years to keep the impressive tilt-rotor project alive. It's an impressive aircraft design concept, originated in Canada by Bombardier-owned Canadair of Montreal, many years ago. The S-92 has been fully certified in commercial livery to CFR and JAR Part 27 and 29-amended (U.S. Federal Aviation Authority and European Joint Aviation Authorities) standards for Transport Category rotorcraft. That puts it into the upper echelons of compliancy to the most stringent commercial aviation standards. This standards regime is in some areas more demanding than mil specs. In a word, safety, is what that means. Of note is the fact that the S-92 is the first and as yet the only type to meet the amended Part 29 requirements. It's an historic accomplishment for the sleek aircraft's designers. Part 29 raises the expectations of machines operating in the rigorous Airline Transport Category. It sets out a new regime in complex systems redundancy and a higher order coping capability in known icing conditions (Part29-Appendix C) -- otherwise two of the nastiest afflictions to impair the operational safety of regular, scheduled helicopter operations. If you can be confident in your systems' fail-safe redundancy, be assured of perfect ice handling, and are able to rely on flawless system health monitoring, you are good to go in safety whenever the schedule calls for a trip or mission. Heretofore the helicopter has taken a back seat to its fixed wing sisters. That is no longer the case. "... 99 years after the Wright brothers' flight..., the S-92's certification was signed, said the FAA's Amy Corbett, on December 17, 2003 to a press gathering. "What a wonder it was," she added, "to see the birth of the world's safest helicopter, on the same day as the first flight." Why Part 29? Safety, reliability and the public's expectation for perfection. Eventually the traveling public will be asked to rely on this regime as transport helicopters become more economical and real estate (city-adjacent and center-city airports require gobs of it) more expensive. Regional transport, city to city, will in very little time become a whole new thing as the once frightening 'thousands-of-moving-parts-flying-in-formation' rattle-trap 'morphs itself into a sleek, VSTOL or VTOL, sophisticated butterfly. Look at the S-92 and its precursor Black Hawk class of machines. A beautiful thing is happening. If you like a Collins panel, you'll love the S-92 even more. 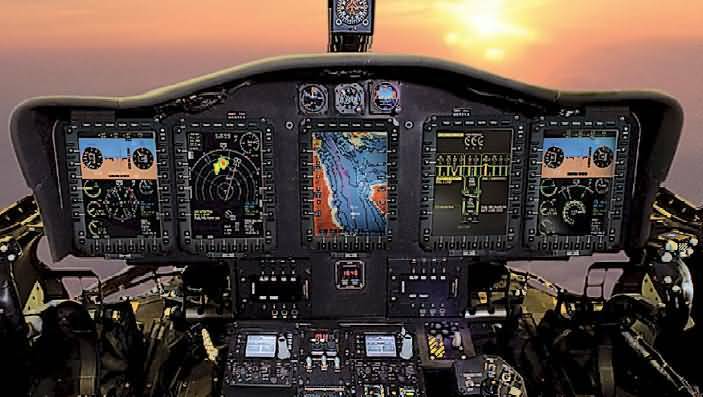 Rockwell Collins is a team member on the S-92 proposal and as you can see from the illustration below, has filled the panel with the good stuff. The Sikorsky S-92 is a new aircraft emerging from a five-machine development programme that opened the new Millennium with fresh hope for an industry starving for new development. 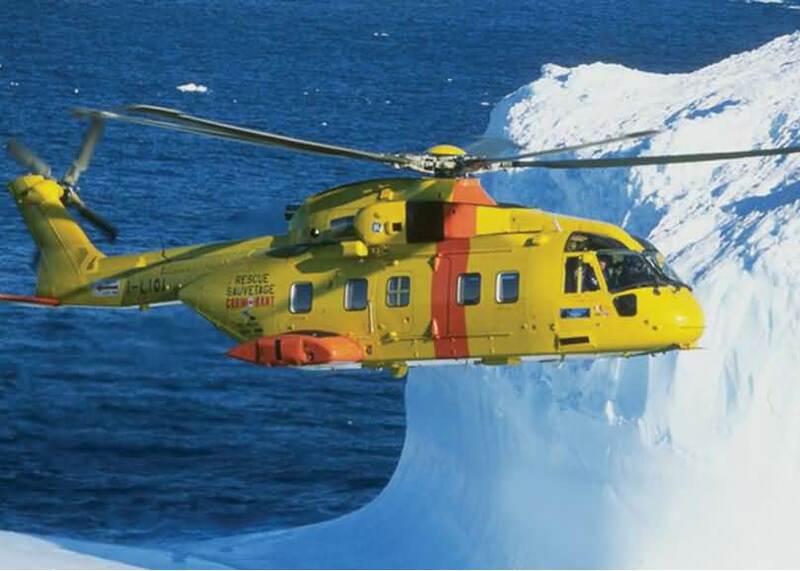 The precursor airframe to the S-92, also a composite and metal blend, has over four million operational hours and an enviable reputation for robust performance and reliability. The U.S. operates both the Black Hawk and Seahawk, smaller airframe versions of the new aircraft using the same engine GE CT7/x family. It is historically the most intriguing record of reliability for new and exceptional engine and airframe technology marriages. All of the presidential rotary-winged craft are flown by pilots of HMX-1, a marine squadron dedicated to presidential support. Marine Helicopter Experimental Squadron (HMX-1) was established at MCAS Quantico on December 1st, 1947, Colonel Edward C. Dyer commanding. Its mission was to develop techniques and tactics for the various uses of helicopters in amphibious operations. Ten years later HMX-1 becomes the Helicopter Squadron for the personal transportation needs of the President of the United States. Marine One is the call sign used when the United States President is on board one of the HMX-1 Marine helicopters. 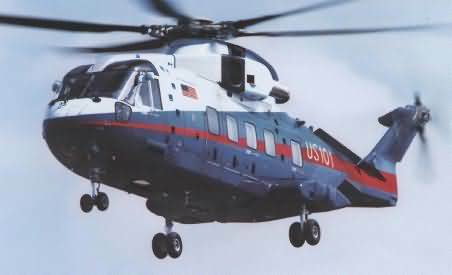 The primary presidential helicopter serving the George Bush administration and previous Presidents since 1976 is the Sikorsky VH-3D ( a variant of the highly respectable and venerable Sea King). Predecessors include the Bell UH-1 Huey, the Sikorsky CH-3 Sea King, The Sikorsky CH-34C Choctaw, The Boeing CH-46 Chinook, The Bell 47-J Sioux, and Sikorsky UH-60 Black Hawk. Aircraft alphanumerical designations are typically modified to 'VH' from 'CH' to reflect the VIP role of the aircraft. 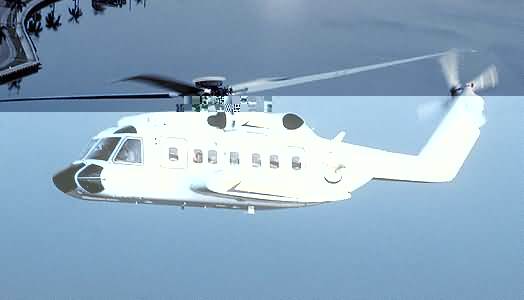 It's a contest in a currently restive state that foreseeably pits Connecticut-based Sikorsky Aircraft Corp.'s S-92 helicopter against a U.S.-European consortium made up of Lockheed Martin Corp., the British-Italian aerospace firm Agusta/Westland and Fort Worth-based Bell Helicopter, offering the US-101, derived from the EH Industries EH101. Proposals were first submitted February 2, 2004 to the U.S. Navy and U.S. Marine officials overseeing a somewhat precipitous proposal request given the political climate. The U.S. Navy will not be getting its programme funded in the near term. Delivery should be sometime in 2007 or 2008 based on life-cycle support predictions for the existing aircraft. Selection will not likely occur in the current presidential term although that is not absolutely certain. The US-101, a version of Agusta/Westland's EH-101 helicopter, would be more than 65 percent American-made, according to Lockheed and Agusta/Westland officials. They point out that Britain and Italy, where some components would be manufactured, have been America's staunchest European allies. They are not mincing words on this obviously important aspect of current political trends. Bell and Agusta/Westland would form a joint venture to build and assemble the US-101. "We're pleased to be a part of the Lockheed-Agusta team," said Bell spokesman Carl Harris who has joined the competitive 'fight' and touted his firm's laurels in literally hundreds of such teamed competitions. Lockheed's System Integration division in Owego, N.Y., is the prime contractor for Team US-101 and would install the complex navigation and communications systems. Sikorsky's S-92 helicopter is a new, larger aircraft developed from the U.S. military's widely used H-60 Blackhawk/Seahawk helicopter. The S-92 is designed to be a multi-mission helicopter. Payload: Up to 10,000 pounds. Payload: Up to 13,500 pounds. Cabin dimensions do not apply to the presidential helicopter. Cabin volume does not apply to the presidential helicopter. Aircraft length (nose to tail) 63 ft. 1 in. Aircraft width (across sponsons) 14 ft. 11 in. Subject to environmental conditions and loading. Increased with auxiliary fuel or air refueling. Copyright © 2004 MPRM Group Limited. All rights reserved.